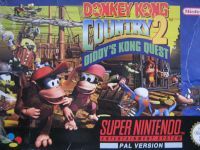 Donkey Kong Country 2, second game in the Donkey Kong Country Series, was developed by Rare for the SNES. It was released in 1995 by Nintendo. While in the first game Donkey Kong, together with Diddy Kong, had to get Donkey Kong's bananas hoard back from the bad King K. Rool and his Kremlings, this time it is Donkey Kong himself that was taken by K. Rool. So now Diddy Kong teams up with Dixie Kong to rescue the big ape. Like the other parts in the series, the basic game is a solid 2D platformer with a pre-rendered graphical style, allowing for fast paced gameplay. In DKC2 there are more hidden bonus areas compared to DKC1. In each bonus area a Kremcoin can be found. There are 75 in the whole game. These coins can be used to open up routes to extra levels in the Lost World. Apart from the kremcoins, the player can also collect Banana coins. These coins are unlimited available, but the amount is not saved with the progress like the rest of the game. These coins can be used to buy hints, buy transportation and save the game. The last type of coins are the DK Coins. In each level there is one DK coin hidden. On the map screen is displayed whether all Kremcoins and the DK coin have been found in a level. As with the first DKC the game challenges the player to find everything hidden in the game. In DKC2 there are a number of animal buddies, some were present in DKC1 but there are also some new buddies introduced like Rattly the Rattlesnake, Clapper the Seal and Squitter the Spider. In DKC2 there are some parts of levels were the monkeys are turned into an animal buddy and the player has to control the animal buddy, without Diddy or Dixie riding them. The different worlds in the game are more varied than DKC1, including levels in the following styles: lava, swamp, jungle, underwater, ice, ruins, pirate ship, mines, bee hive and others. The game also features wind in some levels, both horizontally (allowing for big jumps, or adding difficulty when manoeuvring through spikes) and vertically (letting the Kong's float upwards in the level).